Hi everyone, here’s a post to update everyone about my ongoing battle with our worst enemy: Acne. It has been more than six months since I’ve last wrote anything for the “Be Acne Free” Column, and I’m happy to hear feedback from my readers that they have seen an improvement on me from the very first time I started this. Well, I won’t say the past six months have been smooth-sailing, as I still do have bad breakouts now and then. There has been quite a few personal emails and comments asking me about my facial/TCM sponsorship etc., so I thought this article will come in handy if you wish to know the improvement! Note that the progress is based on almost no facials, compared to the previous year where I had one facial almost every week for a few months. I was VERY not used to not having regular facials, and after having regular extractions by Sylvia Skin Atelier, I start to panic every time I have breakouts. However, from the photos above, you can see that the proper maintenance Sylvia Skin Atelier have been providing me (previously) had allowed my skin to improve and by using the products recommended by them, the scars left behind by new pimples are healing faster! Here’s the range of skincare products I got from Sylvia Skin after ending my Exuviance treatment in late December 2013. While Exuviance controls the pimples, suppresses the breakouts, and lighten the scars (with chemical peeling), Institut Esthederm (IE) actually soften the skin, purges the “toxin out” and then speed up recovery. So during my 10 treatment sessions using IE, there were a few bad cases of breakouts initially due to the skin adaptation to the new products. (Remember the suppressing VS purging out?). But after continuous usage of the products and treatments, my skin was back to normal condition, in fact it was softer, more supple and less sensitive by the end of the 10 sessions. The skincare tips Sylvia taught me helped me a lot, even after the sponsorship ended, in choosing the right products, as well as learning to take care of the skin when there are break out cases. After using the above products for 3-6 months (products like cleanser last for only 3 months), I am happy to announce my top two favourite products are the “Deep Pore Cleanser” and “Pure Control Care“. Whenever I have pimples/acne that couldn’t come out, the Gentle Deep Pore Cleanser (SGD$68) will never fail to bring out the impurities. The cream-like cleanser thickens when I massaged it on dry skin, clinging onto my skin like a (white) mud mask. The deep cleansing emulsion absorbs the impurities deep within the pores under the effect of massage and my acne will either disappear or pop out after the wash.
As for the “Pure Control Care” (SGD$79), it was able to normalizes my skin sebum production and lessen the breakouts. When I apply it in the day (after toner, before sunblock), my skin is less shiny for the whole day, my skin texture improved and complexion is clearer after using it for a few months. The Pure Control Care promotes peeling, thinning of the stratum corneum and eliminates impurities and blackheads. It also helps the skin to regulate its own purity, boosts the skin’s vital functions and its cellular activity. As for the other two products: Calming Cleansing Milk ($62) and Cellular Water Spray (200ml: SGD$79), it calms the skin while removing makeup while the Cellular Water Spray help “reprogramme” our skin cells by providing our skin with freshness, radiance and vitality. For me, I prefer the “Simple Skincare Cleansing Facial Wipes” Sylvia recommended previously as using wipes somehow made me feel like I’ve cleaned my face more thoroughly! Although there has been significant improvement with the use of IE products, I do still have bad face days. These happen when my menses is late, or when I have late nights (All it takes is one late night for my worst friend to appear). Confession: I went back to Dr Chung when I start having super duper big acne due to my late menses! Dr Chung has her clinic moved to People’s Park Complex and offer more services now! If you are wondering how acupuncture works on my menses and acne, you can refer to my past blog post about the treatments. But basically, the acupuncture reduces the swelling and regulates my menses, as well as my constipation problem! I also tried out the new Anion Health Care Machine (负离子养生仪). The Negative Ion Treatment uses the Anion Health Care Machine uses a high-pressure and low current high-voltage electrostatic field to purify the blood, regulating our blood acid-alkaline balance, as well as improving our cells, metabolism, and tissue recovery. There was practically no feeling, to me, it was just a padding placed on my stomach while I take a nap. As for the effectiveness, from what I read, this is like drinking alkaline water, something I need to do regularly, but I’ve only done the treatment for 3 times. But it is a good alternative for people who are scared of pain! (I did acupunture and then the Negative Ion treatment). P.S. I heard from Dr Chung that there were readers who went to her after reading my blogpost (they had bad acne like me!) and experience tremendous improvement! Although I’m not allowed to post any of the photos here, it is still great news to see the changes! If you hope to see the photos, just visit the clinic for the free consultation and Dr Chung will be happy to share with you!. Sponsored services aside, I thought I will share my experience about samples. I used to be skeptical about receiving and using samples, as I always thought samples will never be enough to tell whether the products are good or not. I was very wrong! Samples are actually the best way to save money and tell you whether the products are suitable for you or not! It was through the samples that I find out the effectiveness of Vichy. I took some of the many samples I’ve received from Vanity Trove with me on my trip to Malaysia, Vichy Normaderm Deep Cleansing Purifying Gel being one of the few brands. My mentality was only to use up the samples and for convenience, not having to bring full size bottles with me. I had a case of terrible breakout during the trip due to the diet + hot sun + late nights, and the purifying gel actually helped calm my acne and they disappeared after 1.5 days! The cleansing gel is rich in Salicylic acid and Totarol for cleansing action and in Eperuline for anti-irritating action. Well, although I am recommending the Vichy product, I would have never discovered the product if not for Vanity Trove (VT). It is actually a great concept to try out the product samples before investing large sum of money on the wrong products. In case you are new to the Vanity Trove, it is a monthly trove of skincare, cosmetics, beauty goodies delivered to your doorstep with just SGD$25. There is the Surprise Box, where there will be 7 random (surprise) products for you to experiment. Besides that, there is also the customize-able Vanity Trove Box. By filling in your beauty profile, VT will display a long list of items optimized for you and you can select 6 to try out! Beauty products and treatments aside, I guess everyone knows that changing our lifestyle and making it healthier is the most natural and permanent way to achieve better skin. But of course, expensive gym membership and the lack of perseverance makes it difficult for many people to adapt to a healthy lifestyle properly. For me, I hate to be tied down by gym memberships and packages. I got to know Vince from Zesty Kickz from Shixin, who offers flexible and affordable training programs (mainly for ladies!). Besides Zumba, Zesty Kickz also offers Ladies Kickboxing, Shape N Tone classes. I won’t talk much about Zumba and Kickboxing since the name of the classes says-it-all. Shape N Tone is a 30 minute intensive circuit training class for ladies who want to tone up and let out their stress. Compared to personal trainings sessions which I’ve attended in the past, I prefer Shape N Tone where I get to carry out various exercises (it’s different every lesson) together with a group of other ladies. Why so? Because I don’t feel stressed out with a trainer staring down at me all the time, and I am not the only one “suffering”! It is really fun to work out with a group of people, knowing that all of us are in it together. Moreover, we do each exercise for only 1 minute (3 sets each), and by the end of the lesson, everyone’s panting and perspiring together (*plays HSM “We’re All In This Together” song please :P). Above is the promotion Zesty Kickz is offering my readers, and if you wish to come for free trial lesson, I can bring one person with me everytime, I go for lessons every Monday (Shape N Tone 6.45pm + Kickboxing 7.15pm), Wednesday (Shape N Tone 6pm + Kickboxing 6.30pm + Zumba 7.30pm) and Saturday (Shape N Tone 12.15pm). If you are interested to join me and try out the lesson, feel free to leave a comment below with a working email so that I can contact you! After working out with Zesty Kickz for more than 2 months, besides a more toned thighs, my metabolism rate is higher, I don’t get sick that easily, and my period is more regular (despite my regular drinking of bubble tea!). Hope this post helps everyone! I’ve provided the list of addresses and contacts of the trusted companies whom I had been working with for your easy reference! If you hope to learn about my past experiences with these partners, do refer to my “Be Acne-Free” Column! Promotion: How do you #rejuvenate for a healthier you? Promotion: Key in TIFF to receive 10% off the price stated below. *Package to be completed within a year. *Disclosure: No monetary compensation was received for the article. Please be rest assured that even though the products and services were sponsored, it does not have any bearing on the content of this post. Opinions stated are genuine and honest. Also note that all sources, information, content, links are valid to change at any time. Chanced upon your blog as I was desperate to find some solutions for my acne issues. Thank you for sharing so transparently! Am keen to try out the TCM, since I have been on roaccutane and although it cleared my skin in the period of time I was on it, the effects wore out after I stopped. Hi Jasmine, I avoided roaccutane because it is not sustainable. Hope TCM worked for you! For me, I learnt how to control my hormonal imbalance and reduce scarring effectively after going to TCM! I understand the battle with acne, as I’ve been dealing with acne for many many years. Apart from Vichy, I never heard of Institut Esthederm before. this is good and very helpful, I would like to share with my friend have skin problem? Thanks. Hi Tiffany. 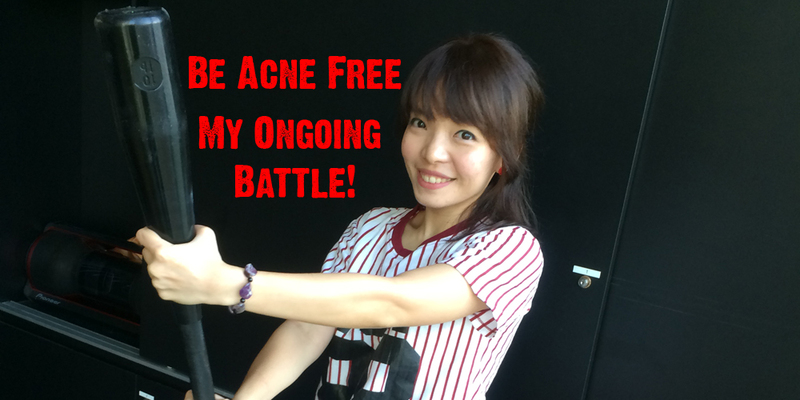 Glad to know that you are winning the battle with acne! I experienced the same thing last year in June, and again this year. Suddenly got outbreaks of adult acne 🙁 It’s nice to know that I’m not alone in dealing with this. We shall triumph over these stupid pimples! Haha. Nice word, adult acne! You still look good though. I guess it’s more of the weather changes etc for you? Having acne is part of our maturity and being a teens but sometimes it’s not good because it’s so irritable and sometimes because of having acne we loose our confidence. It’s glad to know that you are now free acne. It’s nice to have the expert deal with acne problems. They would give you more lasting solutions. Wow, your acne battle is very holistic! I love how aside from directly treating your face with the various products, you did TCM, as well as some lifestyle modifications. I think what you are doing is really beneficial to your acne battle, keep it up! Acne is no friend of mine, but I am happy that you are seeing some changes. My preteen daughter is starting to get a few pimples and it is going to be an interesting road teaching her how to care for her skin now..
Good to see you have finally found your best therapy! I still in the midst of choosing right product..
Acne should be taken care of immediately with proper care all day long. More methods are being used nowadays and personal care should be practiced.. I have my ways with stubborn acne early in my teens but as I aged they simply disappear. Your condition is getting better as seen on your photos. The products you’re using suits your skin. wow nice with ladies kickboxing, I wanna learn too, not sure if where available in Malaysia. about acne, I have too even though I have matured skin.